Bellcore was a telecommunications research and development company that provided joint R&D and standards setting for AT&T and its co-owners. 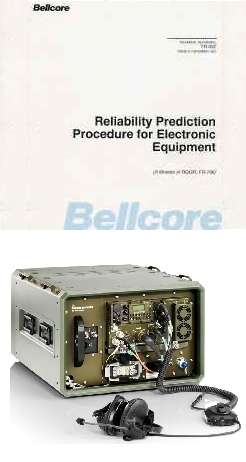 Because of dissatisfaction with military handbook methods for their commercial products, Bellcore designed its own reliability prediction standard for commercial telecommunication products. In 1997, the company was acquired by Science Applications International Corporation (SAIC) and the company's name was changed to Telcordia. Telcordia continues to revise and update the standard. The latest two updates are SR-332 Issue 1 (May 2001) and SR-332 Issue 2 (September 2006), both called "Reliability Prediction Procedure for Electronic Equipment." The Bellcore/Telcordia standard assumes a serial model for electronic parts and it addresses failure rates at the infant mortality stage and at the steady-state stage with Methods I, II and III [2-3]. Method I is similar to the MIL-HDBK-217F parts count and part stress methods. The standard provides the generic failure rates and three part stress factors: device quality factor (Q), electrical stress factor (S) and temperature stress factor (T). Method II is based on combining Method I predictions with data from laboratory tests performed in accordance with specific SR-332 criteria. Method III is a statistical prediction of failure rate based on field tracking data collected in accordance with specific SR-332 criteria. In Method III, the predicted failure rate is a weighted average of the generic steady-state failure rate and the field failure rate. If you would like a quotation for reliability MTBF calculations to Telcordia SR-332 or any of the other reliability models, please contact us on the numbers below.